County Commissioner Ken Hagan told other members of the county’s Transportation Policy Leadership Group that he wants the group to make a final recommendation on projects and financing in June. The county commission could then begin taking steps for a referendum to be held in November 2016, he said. Hagan said he foresees the county commission taking a final vote in September or October to put a sales tax increase on the 2016 ballot. That will give business groups more than a year to plan and carry out a campaign to promote passage of the sales tax. No public money can be spent to promote a referendum. Despite having about 50 people at each meeting, on average, some members of the group wondered whether enough was being done to draw in all demographics and engage the community. Since Commissioner Hagan cannot yet pursue his dream of a new baseball stadium in Hillsborough County, perhaps he wants attention for something else. 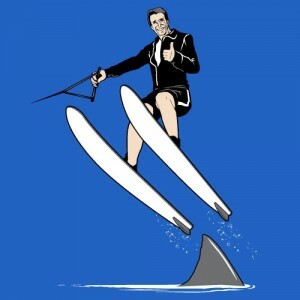 So did Commissioner Hagan "Jump the Shark"? The public engagement meetings have not been completed. There's been no plans presented or discussed yet. There's been no due diligence or any discussion regarding all the funding options or what "needs" must be paid for versus the "wants" in our current county budget. There's been no official priorities set for the county budget. Should that $15 million soccer complex by nixed to help fund roads? Should the county stop funding lower priority items to fund transportation? Our county revenues are heading up so should those increased revenues go to fund roads? None of those discussions have taken place but Hagan is ready to march forward to put a sales tax referendum on the 2016 Presidential year election ballot. Should we be surprised? 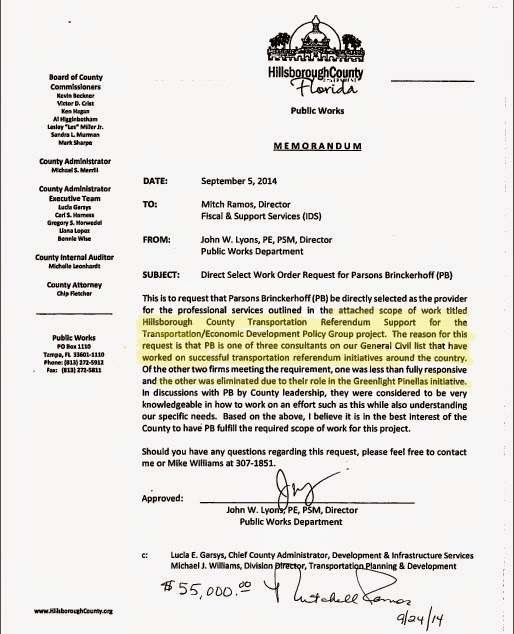 The scope of work handed to Parsons Brinckerhoff via no-bid from the county last September was titled "Hillsborough County Transportation Reference Support". Was that being prescient or simply always the plan? Which business groups are lining up to support a referendum they know nothing about? Or do they know something the rest of us haven't been told? Is it the Tampa Bay Partnership and the Chambers of Commerce? Haven't they struck out at least 4 times supporting sales tax referendums in the Tampa Bay area? Chappell-Roberts, the ad agency closely associated with the Tampa Bay Partnership, owns the GoHillsborough website name. Politically well connected PR consultant Beth Leytham is getting paid almost $300K of our tax dollars to do PR work for GoHillsborough. We assume they both have access to all the GoHillsborough data, information and email addresses gathered at taxpayer expense. What an easy way for them to jump over to the private sector and help launch that business campaign Hagan references. They'll be able to make more money in support of a referendum they directly helped get on the ballot, at taxpayer expense. The GoHillsborough Campaign is in its last phase of community meetings and will conclude with a tele-townhall on May 21. We can only speculate why the participation rate has been low but that makes the cost of this effort even higher. However, here are some observations about this campaign. I've attended a number of the public engagement meetings. One of the most discouraging things I noticed is that most of the county commissioners themselves weren't participating in these meetings. Commissioner Hagan has not been to one GoHillsborough meeting - but he already wants a referendum. The entire Policy Leadership Group effort, since it started in July 2013, never provided the ability for the general public to speak directly to the elected officials. The PLG meetings were held like workshops, no public comments could be made. When the previous public engagement effort was done from August 2013 through December 2013 that actually allowed public comment, the commissioners were specifically told to stay away. And while we paid for that effort too, there was never any report or summary presented or anything public presented back to the PLG about those meetings. The format of the Parsons Brinckerhoff GoHillsborough campaign doesn't allow for public comments, except in writing on the comment forms. This entire PLG effort appears to have been organized around ensuring there's no direct communication between the elected officials, their constituents and the general public on this issue. Do you consider that odd? Ironically, when Parsons Brinckerhoff made their first report to the PLG last month after the first phase of meetings, George Walton of PB stated one of the feedbacks they received was that the public wanted to speak to their elected officials. Unless the county commissioners actually showed up at any of the meetings, the public did not have any opportunity to engage or speak to the county commissioners. Walton invited the commissioners at the March PLG meeting to show up at the tele-townhalls. I've listened to both tele-townhalls and no county commissioner participated in them except for a recorded message from Commissioner Murman at the first one. We'd like to think that all the county commissioners would want to engage with the general public on this issue. Regarding the issue of public participation, I am not aware of any goals or expectations set up front by the county regarding public participation. All we heard at PLG meetings was the need for "robust public outreach" but no one defined what that is. With the amount of tax dollars we're paying Parsons and PR consultant Beth Leytham, the county should have discussed upfront with Parsons and Leytham some estimate of the number of people they expected to reach and wanted to reach to participate in the public engagement effort. How do they actually measure success? They can't because no measuring stick was defined. As we noted, public participation was the big topic at Wednesday's PLG meeting. Bob Clifford of PB, reported that the community engagement was going "very well". Clifford's definition of "going well" is there's been 1400 participants over 26 meetings (an average of about 54 people per meeting), 1000 comments submitted, 2 tele-townhalls with over 12K attendees, 40 speaking engagements and over 2K Likes on the GoHillsborough Facebook page. The Tribune called this "a vigorous public outreach campaign". Do you? Is that really considered a success and going well, especially for how much this effort is costing taxpayers? There seemed to be genuine concern from a number of PLG members at yesterday's meeting about whether this effort is reaching enough people. County Administrator Merrill stated that we're doing the "best we could with what we had" and that they would've needed a couple of million taxpayer dollars to do a full blown advertising campaign. Huh? Same old same old answer - I can do more just give me more money.... The intent of GoHillsborough wasn't to be an advertising campaign right? Or was it? Commissioner Murman asked Clifford if there's been enough attendees participate that can justify the proposals that result or is there some formula regarding attendance that will justify the outcome? Clifford could only answer that they are getting consistent information. County Administrator Merrill stated it's the "quality" of the information not the quantity. What quality standard are they measuring against? Nobody knows. Since there were no requirements defined upfront, GoHillsborough can just make it up as they go along. One of the biggest flaws of the GoHillsborough information gathering effort is it is NOT a data driven effort. It is an OPINION driven effort (and of course everyone who participates has one). The "options" buckets provided to give an opinion is very flawed. While there were numerous specific road option buckets from resurfacing to asset preservation to road widening to intersection improvements to ATMS (timing our lights); there was no such differentiating buckets for transit. Transit only included a big broad bucket for new/expanded transit routes, more frequencies and weekend service. What does new/expanded transit routes mean? Is it simply expanding our existing direct or express routes or expanding the MetroRapid BRT's? Or is it some form of new transit - managed bus toll lanes, dedicated lane, gold standard BRT or some other variation of BRT, streetcar, light rail, commuter rail, ferry service, monorail or something else? There is no way to accurately extrapolate from a big broad bucket for new/expanded transit routes to what kind of specific transit people actually meant selecting that option. It's as if GoHillsborough didn't want to give the public the ability to choose. Why not? Don't transit supporters, who keep advocating for more transportation "choices", want to be able to choose the specific mode of transit they prefer? To the general public "fixed guideways" implies fixed rail lines. There are fixed guideway transit routes reflected on the maps. However, nowhere in the meetings I attended was there any information about the AEComm transit assessment done last May. AEComm reported that Hillsborough County does not have the ridership to qualify for federal funds for high cost fixed guideways transit solutions such as rail or dedicated lane, gold standard BRT. They also stated that investments in transit should be done cautiously and prudently. In other words - invest in transit incrementally not boldly. That assessment was never publicly presented to the PLG. However, at the August PLG meeting it was stated that everyone should read it. The public can't read that assessment if they don't know it exists and don't have access to it. Taxpayers paid for that assessment. Why wasn't that assessment made available or at least a link provided to the assessment through the GoHillsborough campaign so the public could read it? Wasn't part of the GoHillsborough effort to educate the public? The current phase is starting to include some costs and some good information is provided regarding how much it costs per mile for road improvements or different types of transit. It is an eye opener to see how expensive transportation improvements actually are. However, additional cost-benefit information should be provided. The cost information that is missing is the cost per trip. We hope that Parsons provides cost per trip level of information when they provide their various recommended scenarios to the PLG. The cost per trip for a highly utilized asset, one that benefits many, is much lower than the cost per trip for an under utilized asset that benefits far fewer. That analysis should be included in how and where our tax dollars are spent. Advocating to march forward for another large pot of your tax dollars before that "methodical approach" has even been completed, before any plans have been presented, before any full discussion on what's to be funded has been done, before serious cost-benefit analysis has been done or before prioritizing our existing budget is not fair to the taxpayers. But it is the easy way out - don't make any of the tough, fiscal decisions of prioritizing our budget and looking at all funding options, just ask for a big pot more. Perhaps one reason for low participation in the GoHillsborough campaign is that the million dollar taxpayer funded Parsons Brinckerhoff/Beth Leytham/Chappell-Roberts crony insiders "methodical approach" is simply cover for something that was already decided - the county wants another big pot of your money even before they know what to do with it. Does Commissioner Hagan "jumping the shark" simply confirm that?